Koi (Cyprinus carpio), larger relatives of the goldfish, are drab silver fish in the wild, but generations of selective breeding have produced much more colorful fish. Koi are hardy; they can survive in large outdoor ponds as long as they have filtration to keep the water quality acceptable to the fish. 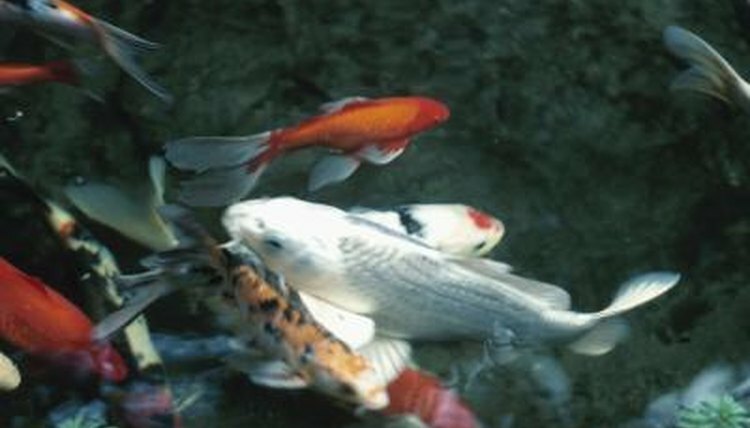 Sand filters can help keep the water at an acceptable quality for koi. In ponds and aquariums, three types of filtration are common: mechanical, chemical and biological. Mechanical filtration consists of physically straining debris from the water. With chemical filtration, chemicals remove or neutralize various impurities, improving water quality. The final type of filtration, biological, consists of encouraging the growth of beneficial bacteria that break down fish waste. Biological filtration is important to the long-term health of a pond or aquarium. Sand filters provide mostly biological filtration and a bit some mechanical. Sand filters force water upward through a bed of sand. This causing "liquification," whereby the sand takes on liquid properties. When the sand particles get suspended just right, their functional surface area increases, encouraging the growth of bacteria that break down ammonia -- a nitrogen compound that koi produce as biological waste -- into less-toxic compounds. Most commercial sand filters include screens to filter out large debris, providing mechanical filtration as a byproduct. Sand filters for koi ponds have a few drawbacks. Their pumps can produce a lot of noise as they force water through the sand. They may require maintenance: Many sand filters require back-flushing, forcing water through the filter backwards. This prevents clogging of debris in the filter. For ponds with a lot of debris, it can be a daily chore. A less-common sand filter appears in pet shops: Diatomaceous earth filters consist of silica sand formed from skeletal microscopic plankton. The material produces exceptional mechanical filtration and can quickly make water very clear. However, diatomaceous earth filters work poorly in ponds. The extreme level of mechanical filtration also means that these filters clog quickly, making them more suited to aquarium use than to outdoor koi ponds. In ponds, these filters can require hourly back-flushing due to the amount of debris that typically exists in outdoor ponds.